Thanksgiving is only days away! I’ve been experimenting in the kitchen this past week to create the perfect Thanksgiving dessert. 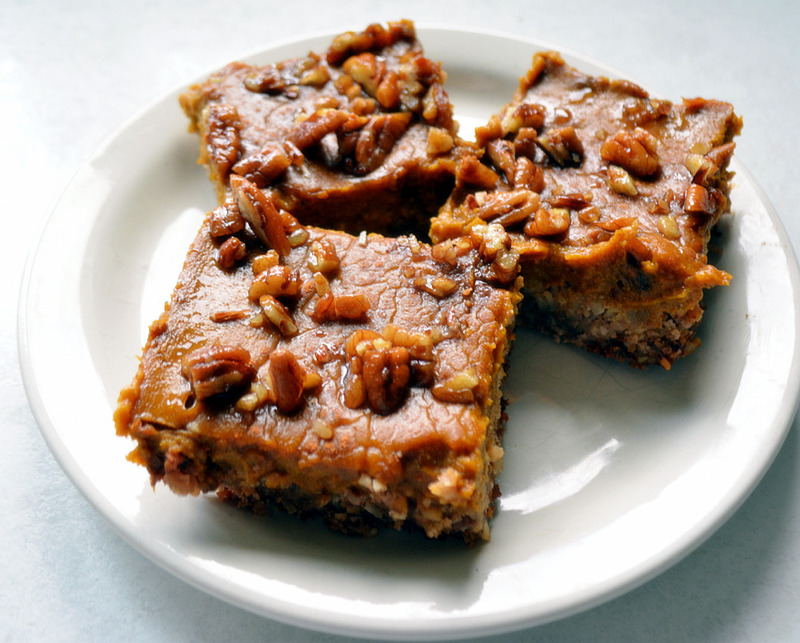 These Pecan Pumpkin Pie Bars are it, and they’re dairy and gluten-free to boot! I think you’ll agree that they provide a deliciously indulgent twist on more traditional pumpkin pie recipes! You’re going to love them!…. Thanksgiving is only days away and I’ve been experimenting in the kitchen this past week to create the perfect Thanksgiving dessert! 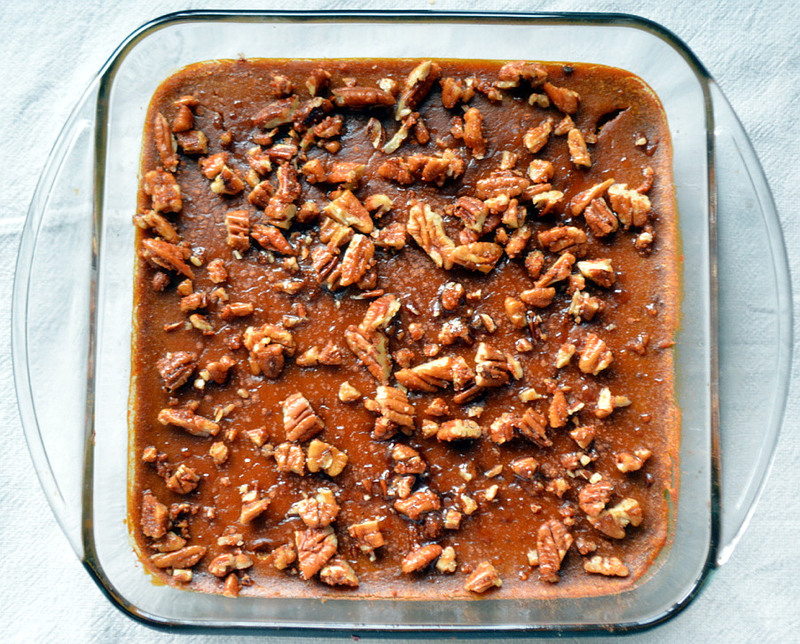 These Pecan Pumpkin Pie Bars are it, and they’re dairy and gluten-free to boot! I think you’ll agree that they provide a deliciously indulgent twist on more traditional pumpkin pie recipes. You’re going to love them! If you’re in the midst of your holiday meal planning, I also suggest that you check out all 28 of my favourite gluten and dairy-free holiday recipes! The crust for these Pumpkin Pie Bars is loaded with pecans, rolled oats and coconut and is sweetened with dates and dark brown sugar. It’s thick, chewy and delicious! I highly recommend using dark brown sugar instead of golden brown sugar for the crust as well as the pumpkin pie filling. 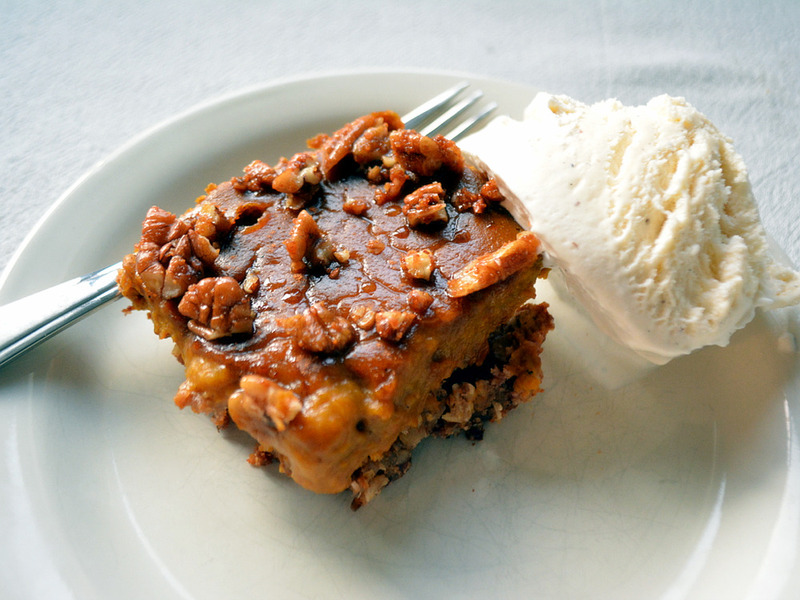 It adds richness and depth of flavour with a hint of molasses to Pecan Pumpkin Pie Bars! First you will process the dates and pecans until all pieces are smaller than a pencil eraser but not too finely ground. 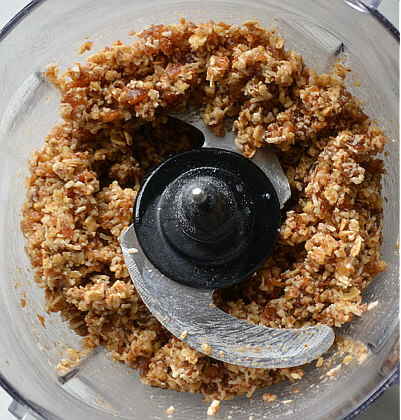 Add the oats, coconut, sugar and salt and will process 10 to 20 seconds or until the oats are slightly ground. Add the eggs and coconut oil to the other ingredients and mix or process until well combined. Grease an 8 x 8 inch baking dish (or a pie plate if you prefer) with coconut oil and compress the crust using a spatula or parchment paper and your hands. Optionally you may also line the baking dish with parchment paper to prevent sticking. Voila! It’s that simple to make your gluten-free homemade crust! Please note that the bars will only be gluten-free if you use certified gluten-free oats in the crust. See the full recipe in the recipe card below! I used organic pumpkin puree to make the filling for the Pecan Pumpkin Pie Bars. Make sure that you purchase pumpkin puree and not pumpkin pie mix from the store (which is already sweetened and spiced). If you’re feeling extra motivated, fresh pumpkin can most definitely be used instead of the canned pumpkin puree! Again, I recommend using the dark brown sugar in the filling for a richer and more flavourful taste. You can enjoy these bars warm out of the oven but they’re also delicious cold! I actually prefer them once they’ve been refrigerated. If you’d like to indulge, top the bars with coconut ice cream or coconut whipped cream to round out this delectable treat! What do you have planned this weekend for Thanksgiving? I’m excited to be heading to Oliver, BC to visit some of my husband’s family! They have also only recently moved to B.C., and since I’ve never been to Oliver I’m excited to explore! I wish you a fabulous long-weekend filled with family, friends, chai tea and pumpkin treats! For a full guide to planning a healthy and delicious holiday meal make sure that you also check out my favourite 28 Decadent Gluten and Dairy-Free Holiday Recipes! 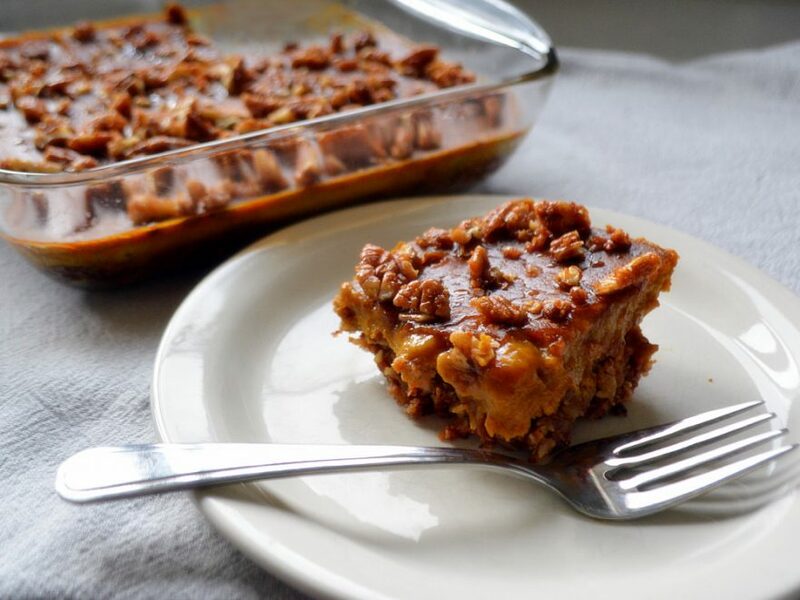 These Pecan Pumpkin Pie Bars are a delectable gluten and dairy-free dessert! You'll love the thick and chewy crust topped with creamy and delicious spiced pumpkin filling. Although they are gluten and dairy-free there is absolutely no deprivation here. You’re going to love them! 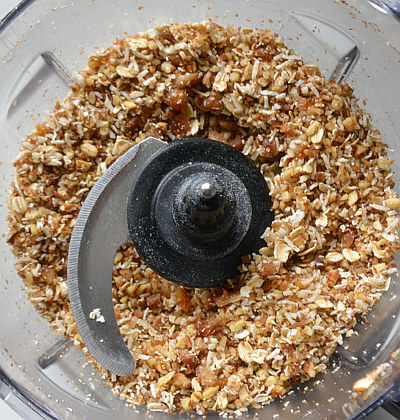 Combine the dates and pecans in a food processor and process on high until evenly ground. The pecans and dates should be smaller than a pencil eraser but not processed so much that they’re powdered. Add the rolled oats, desiccated coconut, dark brown sugar and sea salt to the pecans and dates. Process on high for 10-20 seconds until combined. Add the melted coconut oil and 1 egg to the crust mixture and process until combined. Transfer the crust mixture to an 8 x 8 inch square baking dish or a pie plate that has been greased with coconut oil. Optionally you may also line the baking dish with parchment paper to prevent sticking. Press the crust flat against the bottom of the dish using a spatula or parchment paper and your hands. Bake the crust for 13-15 minutes or until edges are slightly browned while you make the pumpkin pie filling. 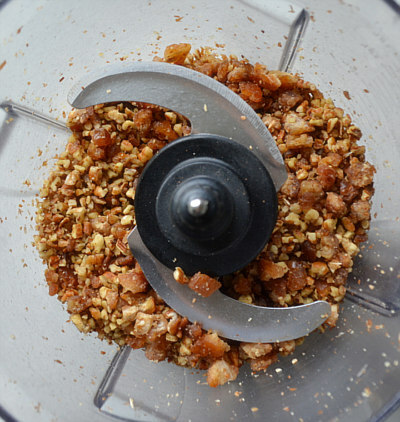 To make the pumpkin pie filling, add all ingredients to the food processor and combing on high. Alternatively you may instead mix all ingredients together by hand. Once the crust has baked, pour the pumpkin pie filling over top of the crust and return to the oven. Increase the temperature to 375°F and bake for an additional 28-33 minutes until the top is lightly browned and the pie filling is semi-firm. Toast ½ cup of pecans by placing them on a pan and baking them in the oven while the pie is cooking for 4-5 minutes. They should be lightly browned and toasted, not dark or burnt. Chop the pecans and toss with 2 teaspoons of coconut sugar and 1 teaspoon of avocado oil. Let the pie cool for 20-30 minutes prior to sprinkling it with the pecan and sugar mixture. 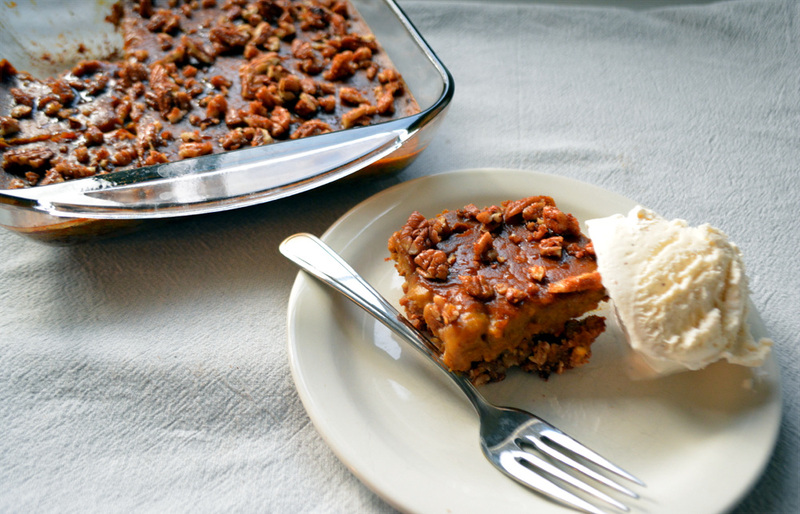 You may serve the Pecan Pumpkin Pie Bars warm, at room temperature or chilled. They’re great on their own and are also fabulous topped with coconut vanilla ice cream or coconut whipped cream! Kimberley, these bars look and sound mouth watering, and I will be making them for sure. I just love the crust, alone. I hope you are enjoying Nelson ( would love to hear about your experience in my home town :-)) And know you will love Oliver. We go there often for the abundance of farm stands and outstanding wineries. Enjoy. Thank you Colleen! I’m loving Nelson so far…it has been everything I had hoped it would be! Will you be at the FBC conference? If so I look forward to meeting you there! Have a fabulous Thanksgiving long weekend! These look wonderful! I love healthy treats! I’m pinning these and will try them as soon as I can! Thank you Cathy! Let me know what you think once you’ve given them a try! Have a fabulous Thanksgiving long weekend! Ooh, these look wonderful! I think they make a great alternative to pecan pie and it’s nice to have a dairy/gluten free option that tastes great. Thank you Alexandra! I’m known in my family for always showing up with a tasty gluten and dairy-free dessert at all occasions. I hope you have a fabulous Thanksgiving long weekend and enjoy plenty of delicious food! I can always count on you for healthy alternatives for my favourite foods! I love this crust and can see using it in other recipes, too. Happy Thanksgiving! Hi Amanda! I will vary my milk alternatives depending on what I’m making. I typically used canned coconut when baking, at least if I want something to be creamy! I also use it for curries and soups. I tend to use either hemp milk or coconut milk in a carton for most other purposes where it doesn’t need to be so thick! Have a great Thanksgiving long weekend! This looks divine. Perfect for a crowd on thanksgiving or halloween with lots of different food preferences. Great job. Thank you Leslie-anne! Happy Thanksgiving! Beautiful, delicious, healthy alternative sweet treats you give us, Kimberly! I love the ingredients of the crust, so much! 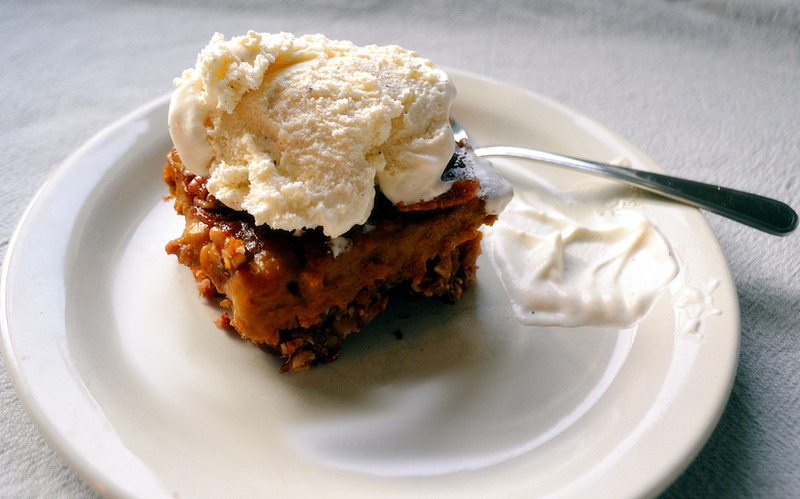 These pecan pumpkin pie bars look sooo good, I’d chose them over regular pumpkin pie! Thank you Nicoletta! I’ve made 3 batches this week to share with friends and family and I’m happy to report that they’ve loved the bars too. Have a happy Thanksgiving long weekend Nicoletta!